The New York Times recently did a nice piece on “digital democracy” that focuses on the use of “crowdsourcing” as a way of engaging citizens. 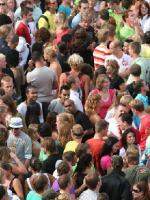 The classic example of crowdsourcing was developed in the private sector by a drug company, of all places. In 2001, Eli Lilly decided to open up its research and development process to a broader community of contributors by posing research questions to a group of scientists and others outside the company. These contributors competed or collaborated to come up with a solution, and the winning solution received a monetary prize. This spawned a new company, InnoCentive, which offers this approach to other companies as well. The approach has expanded and being used by a wide range of industries. For example, a similar contest has been underway to identify innovative ways to reduce traffic congestion. As the Times article describes, this approach – turning to either a defined or undefined audience for ideas, and ranking and sorting these ideas – was used by the Obama Administration during its transition and during its first few months in office. As a result, this idea is now being used in mainstream government agencies. For example, the Department of Homeland Security is using this approach to get input into its Quadrennial Review. As the Administration develops its policy on Open Government, crowdsourcing will likely be one of its more visible tools. The next step will be to develop an understanding of when it works best, as well as a set of best practices. I'm interested in learning more, so I’ll be participating in an IBM-sponsored crowdsourcing effort – which it calls “Jams” -- over the next few days. Dubbed the “Smart Work Jam,” it will explore the future of work and how technology, the Millennial Generation, and teamwork will likely change how its gets done. If you’d like to participate, feel free to join in!